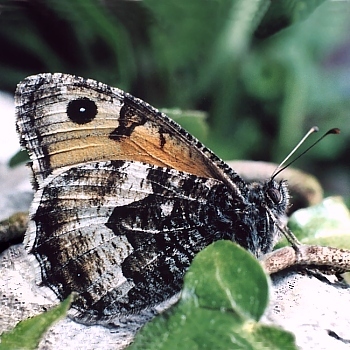 Habitat: The Grayling is fairly common on dry, rocky and sandy areas, especially coastal. Hibernation: Overwinters as a larva. The Grayling has excellent camouflage and when disturbed moves a short distance and merges with its surroundings. The white oval shaped egg measuring c.0.8 mm in height changes to a pale yellow before hatching. 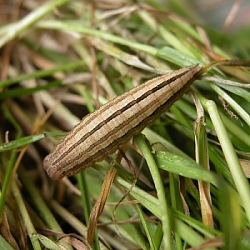 They are laid singly on blades or stems of grass in July and August and hatch in c.17 days. spring when it resumes feeding and growth, reaching full development by early June. 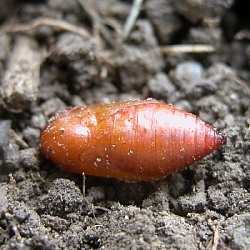 hooks, the pupa is unattached within the cell . This stage lasts c.4 weeks. 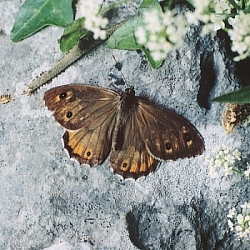 The adult emerges in July and is on the wing in July and August. It is only occassionally seen visiting flowers such as heather, thyme and other purple flowers to feed.